When it comes to travel books and apps, both have a time and place. Reading through piles of educational literature can help you prepare for your trip, but lugging large books through a foreign country isn’t an efficient way to explore. Discover when travel books come in handy, and when it’s more beneficial to refer to apps. In a digital age, it’s easy to obtain all sorts of information from the internet and other sources. One can simply enter a question into a search engine and receive the answer in seconds. For example, if you’re curious to learn more about the culture of Dubai, you can refer to countless online databases for an endless amount of information. However, not all published material is available for free online, and that’s when it helps to have access to educational literature. Travel books are a great tool to invest in prior to embarking on your journey. It doesn’t matter if you’re traveling alone, or with a group of people, it helps to know about the country you’re about to explore, and travel books can help. Travel books might help you gather knowledge about a new country and culture, but they can take up valuable space in your suitcase. Luckily for you, there are a variety of useful travel apps that you can access at the tip of your fingers (literally). 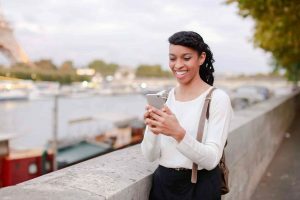 Apps like Duolingo and Sayhi Translate can help you communicate with the locals, while apps like WhatsApp and Viber can keep you connected to family while you’re away. Are you in search of the best place to eat in London? Rather than flipping through a guidebook, you can simply refer to Foodspotting, an app that connects foodies all over the globe! For the most informed and enjoyable travel experience, consider using both books and apps to your advantage. Do your homework prior to your trip, and then travel with ease with your smartphone or tablet! This entry was posted on Wednesday, March 21st, 2018	at 10:25 am	. You can follow any responses to this entry through the RSS 2.0	feed. Both comments and pings are currently closed.